I have to tell you. This is the damned most amazing thing I have found in my search for "ukulelia." 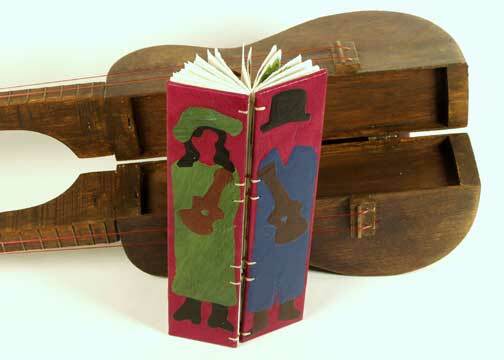 Santa Cruz, CA bookbinder and ukulele player Peter Thomas (in collaboration with his wife, Donna) have made an entire series of playable artbooks out of ukuleles. "One day I thought to myself, "I love to make books and I love to play the ukulele. Can I put these two loves together? Can I make a book out of a uke?" After I made the first one, I thought, "How many more can I make? Each one will have to represent a different book structure, format or concept and each will still have to play...."
There are 22 pieces in the series thus far including the one pictured (jeez, it was hard to pick just one to feature! ): Ukulele Series Book #13 The Ukulele Jam, 2002. "This uke, which was once part of some sort of mechanical calliope, was sawed in half lengthwise. The halves were attached by hinges on the back, with a hasp on the back of the headstock to hold it shut. Small chambers were created in each half and a tall narrow book is inserted in that chamber. The book is coptic bound, with boards covered in Moroccan leather with colored leather picture onlays. The book is a "exquisite corpse" book with interchangeable heads, torsos and legs for 15 different ukulele players."